International superstar Marcia Griffiths recently sat down in Harlem, New York, the heart of the African Diaspora, and shared her heart with Muzikmedia. Marcia covered her entry into the business as a thirteen year old up to her latest release. Whenever the name Brigadier Jerry is brought up in reggae music circles, there is always overwhelming agreement that Briggy is a DJ to be held in the utmost respect. Since the early 1980's Briggy has been a talent all Jamaican (and many British) DJs have looked up to. Briggy originated many popular new styles of Jamaican rapping and his always conscious lyrics were a cornerstone of his solid foundation. Ex-Black Uhuru singer, original One Blood, Wu Tang featuring... Junior Reid is internationally known for his Waterhouse style, as an original Bobo from long time. 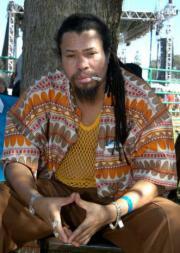 Junior Reid is a spiritual singer, he started his career with the great Augustus Pablo and Hugh Mundell. He now runs his own Junior Reid label. Luciano, real name Jepther McClymont, started his career in the early '90s with releases on the Sky High & Mau Mau label. He teamed up with producer Phillip "Fatis" Burrell which led to his signing with Island-Jamaica, thus making the final breakthrough to a wider audience. Undoubtedly Luciano can been seen as a major force in developing modern roots music. Former background singer for Bob Marley, discusses her upcoming projects and how her transition into Christianity has caused her to sing songs to draw people to the Lord. Cecile, reggae solo artist afflilated with King of Kings, talks about her debut album and acknowledges King of Kings and several other artists she has had the opportunity to work with.